BAR YAMAZAKI is one of the most famous bars under the private management in Japan. 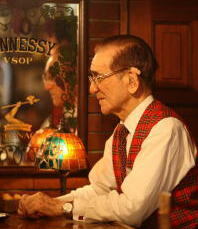 The bar-owner, Tatsuro Yamazaki is 94 years old this year,and the oldest bartender at work in Japan. He has taken domestic grand-prix and has a long list of prize in the international cocktail competitions, and has been conferred the Imperial Prize from Japanese Emperor in 1993, that was the first conferral for a bartender in Japan. Bar YAMAZAKI is famous of a great number of its original cocktails. The most popular cocktail named ”Sapporo” is a prize-winner of the Amaretto Di Saronno Cocktail Competition in Italy. BAR YAMAZAKI promises to serve you with wonderful experiences of most enjoyable drinks with excellent hospitality. Other standards are also available. Over 200 original cocktails are available. Access : One minute walk from Susukino Subway station, exit1(Nanboku-line). copyright©2013 BAR YAMAZAKI all rights reserved.